Radial Keratotomy (RK) is considered the grandfather of refractive eye surgery. Although rarely done in North America now, millions of people underwent RK in the 1980’s and 90’s around the world with over a million procedures done in the United States. In addition, hundreds of thousands of LASIK procedures were later done to these same patients in an attempt to undo the damage done by the initial RK surgeries. The vast majority of RK patients regressed. Most became very farsighted and astigmatic and required eyeglasses. Over the years, I have seen many RK patients who also underwent additional RK procedures followed by one or more LASIK procedures. In every instance, the additional procedures only made things worse. 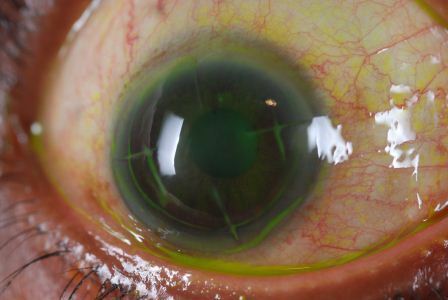 Many patients eventually needed to undergo corneal transplant surgery. For those patients who underwent RK surgery and are now looking for a doctor and new treatments to allow you to see better, I would encourage you to stay away from any additional invasive procedures including INTACS, PRK and LASIK. In recent years, advances in specialty lenses including Scleral, Synergeyes and other unique lens technologies have become available which will allow you to see clearly and comfortably once again without the risk that invasive surgeries pose. VIRTUALLY EVERY POST-R-K PATIENT WHO HAS VISITED OUR SPECIALTY LENS PRACTICE HAS EXPERIENCED A DRAMATIC IMPROVEMENT IN THEIR VISUAL ACUITY AND OCULAR COMFORT. Below are photos and images of some of the eyes we have seen in our office which underwent Radial Keratotomy (RK) surgery. Please complete the form below to have a representative contact you promptly about our services. Dr. Edward Boshnick maintains a cutting edge practice devoted to the restoration of vision and comfort.